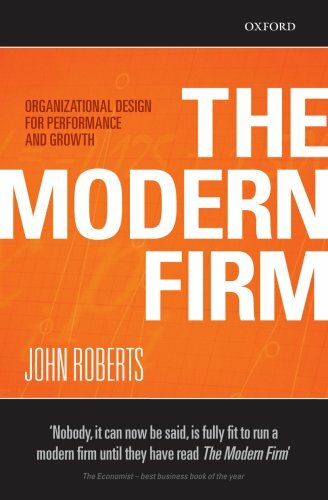 hold.In this book, John Roberts argues that there are predictable, necessary relationships among these changes that will improve performance and growth. The organizations that are successful will establish patterns of fit among the elements of their organizational designs, their competitive strategies and the external environment in which they operate and will go about this in a holistic manner.The Modern Firm develops powerful conceptual frameworks for analyzing the interrelations between organizational design features, competitive strategy and the business environment. Written in a non-technical language, the book is nevertheless based on rigorous modeling and draws on numerous examples from the eighteenth century fur trading companies to such modern firms such as BP and Nokia. Finally the book explores why these developments are happening now, pointing to the increase inglobal competition and changes in technology.Written by one of the world's leading economists and experts on business strategy and organization, The Modern Firm provides new insights into the changes going on in business today and will be of interest to academics, students and managers alike.